Seriously, what can I say? This garden has to be one of the most beautiful places I've ever been. It defiantly sits high on my list of favourite places ever and I truly think it'll stay up there for probably the rest of my life... big call I know! But if you're a rose lover you have to get there one day in the American summer time! My gal pal and fff (flower friend forever) Alice of FLORALISTA and I visited the garden on a whim when we were heading through Portland at the beginning of this month (we were heading for San Fransisco on our 'flower road trip' but ended up flying to the great land of Mexico, but that story's for another day!). Apparently the garden bloomed a month early and we were extremely lucky to see it in all its glory at that time (according to the nice gals we bought our super cool 'rose garden' caps from in the souvenir store). We were in love when we first walked through the gardens, it may sound lame to some, but it truly was overwhelming, so overwhelmed with the beauty and abundance we literally started to tear up! haha! That visit that night wasn't enough and we had to head back the next morning to capture these snaps on my camera.. then we drove back to Seattle and hopped on a plane bound for Mexico! 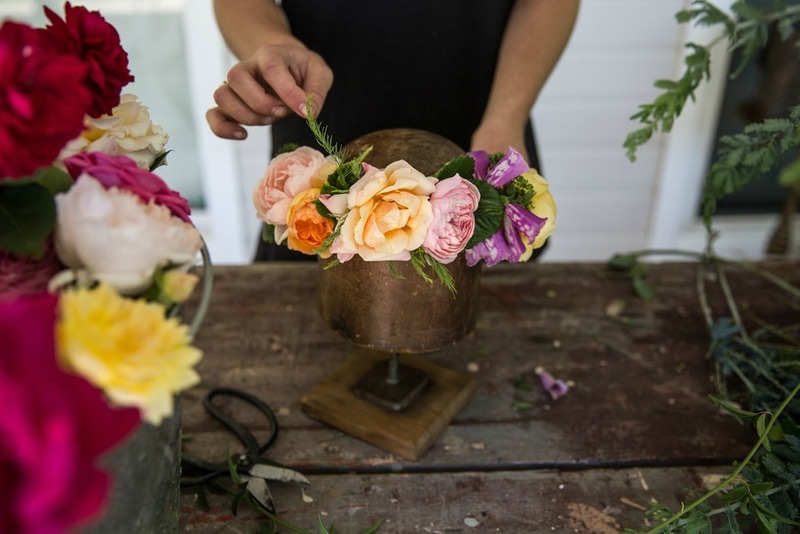 Late last year I came across Mudgee Made Roses on Instagram, Tanya and I (yep same name!) soon became 'instafriends', she lives in Mudgee and grows the most AMAZING garden roses, by amazing, I mean the most beautiful, fluffiest, most fragant, glorious roses I've ever seen!! After months of stalking her Instagram feed, she invited me out to drool over them in real life… saying I was a little excited is a bit of an understatement! Back in January, I finally had a free weekend, so I asked my friend Sophie and her husband George to come along with boyfriend Matteo and I, and we made a weekend road trip of it. Flowers, food & wine.. yes please! After four and a bit hours on the road, we got there and met the gorgeous Tanya and her friend Lara (together they run a DELISH catering company - Mudgee Made). Tanya let me grab my cutters, handed me her rose basket and let me go wild in the garden.. I was so excited!! It was absolutely gorgeous and I had free rein of picking through the beds! The excitement (and picking!) defiantly wasn't over, but it was time for a little break. Lara bought out the most gorgeous hand made flat bread and dips, lamb sausage rolls and mini merangs topped with vanilla bean cream, raspberries and freshly picked peaches from her garden.. I was pretty much having one of the best days of my life and it wasnt even 1 o'clock yet! After our aaaamazing treats, while Soph was shooting all the floral beauty and gorgeousness of Tanya's farm, I got flowering and taught a mini lesson on cake toppers and arrangements with Tanya. How delicious looking are Lara's cakes?? And yes, those sausage rolls did taste as good as they looked! An endless supply of foliages and textures including wattle, berries, asparagus and strawberry leaves were so much fun to play with!! HUGE thank you to Tanya for letting us visit & Lara for the most beautiful food!! It was such a memorable day & I really can not wait to visit again!